AVG Ultimate is a security software suite that bundles a variety of AVG security tools, offering broad protection against most digital threats, in both online and offline environments. Furthermore, it also includes a performance module designed to optimize your system. One of the best features of AVG Ultimate is AVG Zen, a centralized dashboard where you can monitor all devices that are linked to your account, regardless if they’re notebooks, desktop computers or Android devices. In the dashboard you can launch remote virus analysis tasks on all devices associated with your account. Furthermore, the application will show their security status and offer notifications from each of the connected devices. 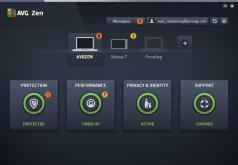 AVG Protection is another tool included in the security suite, designed to safeguard devices against online threats. The module includes AVG Internet Security that bundles anti-spam, a personal firewall, real-time antimalware protection, email and browsing safety functions as well as on-demand and scheduled scans among others. Last but not least, AVG Ultimate is equipped with system optimization tools packed in the AVG Performance module. Among them, you’ll find AVG PC TuneUp, which can perform system maintenance tasks as well as clean your computer to keep it running at maximum performance.